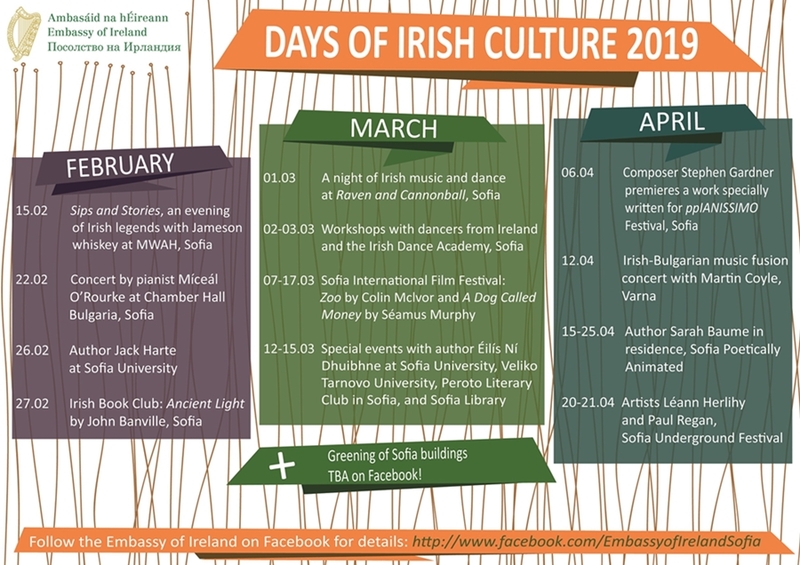 In Bulgaria, the emblematic Irish holiday St Patrick’s Day will be marked with the lighting of key buildings in green, a number of cultural events, and a visit by Irish Minister for Natural Resources, Community Affairs and Digital Development Seán Canney, the Irish embassy said. Ambassador of Ireland Michael Forbes said: “St Patrick’s Day is a chance to come together and celebrate not only the rich Irish heritage, but also our connection to our friends around the world, our common history and goals. That is why this year’s celebration is devoted to Ireland’s commitment to the European Union, with Irish government Ministers visiting all 27 European capitals. “I am delighted to welcome Irish Minister for Natural Resources, Community Affairs and Digital Development Seán Canney to Bulgaria on St Patrick’s Day. His presence is part of our strategy for more direct interaction between our two countries. Although Ireland and Bulgaria are at opposite geographical ends of the EU, we are much closer in terms of historical experiences and our human spirit,” Forbes said. To mark the celebration, the National Palace of Culture, NDK, and the Saints Cyril and Methodius National Library will be lit in green, joining Ireland’s Global Greening festival which brings together more than 250 sites in other major cities such as the Colosseum in Rome, the Leaning Tower of Pisa, the Niagara Falls, the Sydney Opera House, Empire State Building in New York, the Museum of Cycladic Art in Athens and many more. NDK will go green on the evening of the holiday, March 17, while the façade of the National Library will be greened on the evenings of March 17 and 18. The Platinum Business Centre, 26-30 Bacho Kiro Street, location of the Irish embassy, is also joining in the initiative and will be greened on March 18. Canney will witness the lighting of NDK in green on Sunday. During his stay in Bulgaria, Canney will also hold meetings with his Bulgarian counterparts, as well as with members of the Irish community in Bulgaria. In addition to the greenings, the embassy is sponsoring a number of cultural events. Renowned Irish writer Éilís Ní Dhuibhne is visiting Bulgaria in the run-up to St Patrick’s Day to present her new book of short stories Literary Lunch and Other Stories, which includes never-before translated texts, specially curated for Bulgarian readers. Ní Dhuibhne was to give a talk on contemporary Irish literature to the students and faculty of the Veliko Turnovo University on March 13. On March 14 at 6.30pm, Ní Dhuibhne will lead a special Evening of Irish Literature at the Peroto Literary Club, NDK, Sofia. The newest Irish writing translated into Bulgarian will be presented then, as featured in the latest Literary Gazette issue. The official launch of the translation of Ní Dhuibhne’s works Literary Lunch and Other Stories, published by ICU, will take place on March 15, at Sofia City Library, 6pm.